« When Rainouts Are Fun! Well, Day 2 at Rocky Mountain NP was another “keeper”. The morning started out with very little elk activity at Moraine Park. After a short while, I packed up and drove to another spot where elk often occupy in the park, the Beaver Meadows area. Bingo! A very large bull elk was tending to his harem of about 10-12 cows, keeping them from straying away from the group. But one stubborn cow was determined to leave his courtship and go to another bull. After countless attempts, she finally left the group and banded with another bull’s harem. As the original bull worked at getting her back, the rest of his harem began disappearing to a couple of other bulls … quite the “Peyton Place”! Also had another wonderful rainbow over the mountains (will feature in another post). After the elk activity died down for the day (they are most active in the early morning and late afternoon hours) and they moved into the wooded area, I drove back to the Bear Lake area. 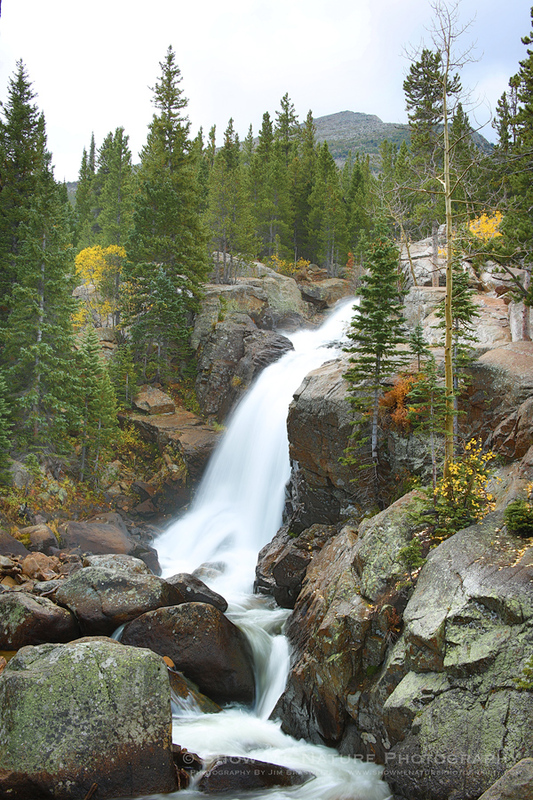 I had read about a wonderful little waterfall, Alberta Falls, that was only a half-mile hike from the parking lot. I also read that fall colors were nice around the waterfall. So, I packed up my 5D Mark 3 body, along with 2 wide angle lenses and my 100mm-400mm telephoto lens (yeh, I also read that Golden-mantled Ground Squirrels were common around the falls), my hefty tripod, and headed for the falls. 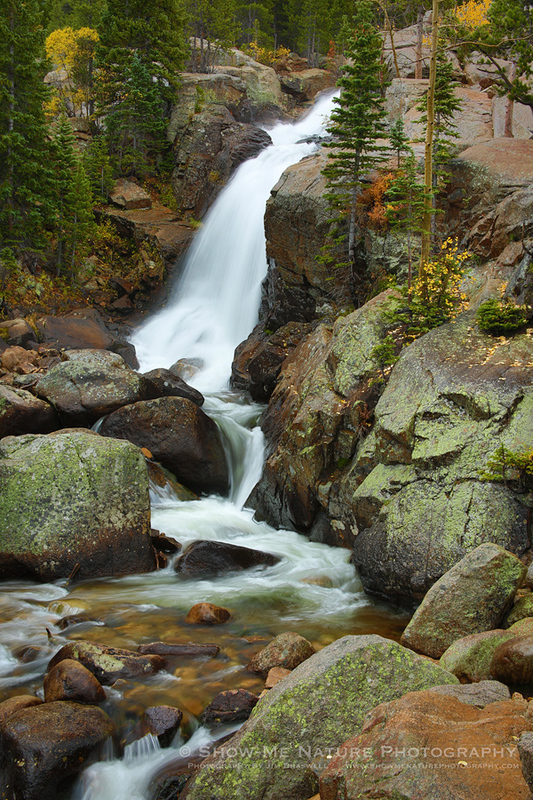 Once I got out of the parking lot and onto the trail, there was a sign that indicated, “Alberta Falls, 1 mile”. Hmmm, contrary to the “half-mile” I read in the book. Oh well, must mean a roundtrip hike of 1 mile, so on I continued. 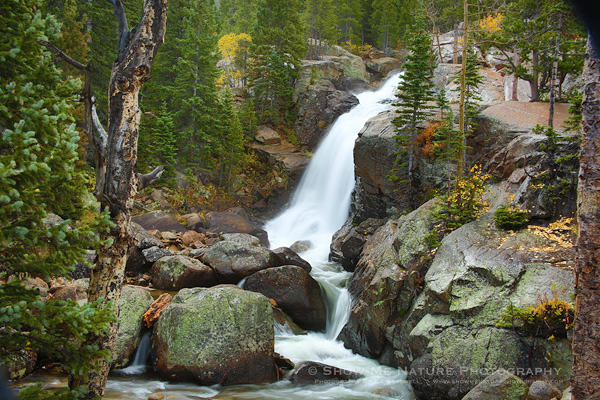 After walking for some distance, I ran upon another sign, “Alberta Falls, 0.5 mile”. Now I realized it was a mile hike, not a half-mile! But being halfway there, what the heck. Oh, and no ground squirrels showed their face! By the way, all of these images are in-camera HDR images. Canon 5D Mark 3 body, set to shoot HDR images, in “Vivid Art” (what I think is the most real and credible mode for in-camera HDRs), at +/- 1.0 EV values. The camera then combines the 3 photos internally and results in a JPG file. Shutter speeds ranged from 0.4 sec. to 0.6 sec. 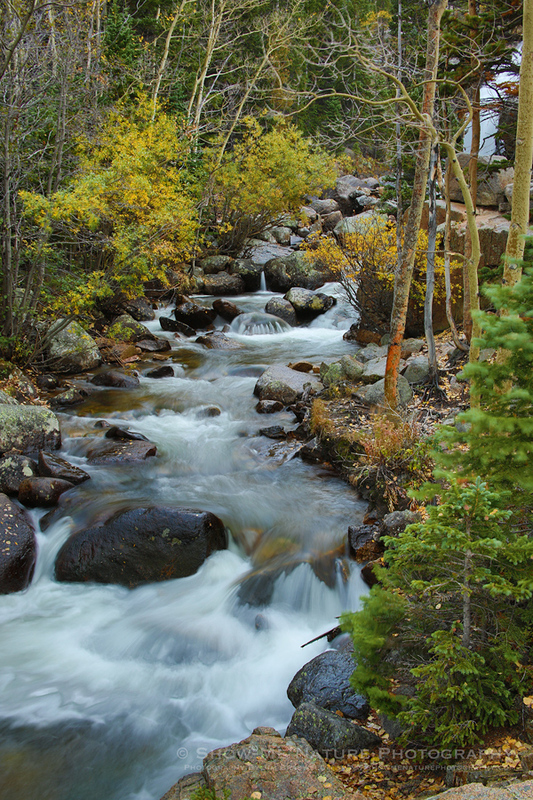 Tags: 2014, Blog, Colorado, fall, fall colors, landscape, National Park, nature, nature photography, photography, Rocky Mountain NP, travel, waterfall.